Bear Mountain Lodge is nestled on a mountainside in the heart of the Cascade Range with 3,500 SQ ft of casual elegance. This beautiful 2-story home is made from hand-peeled logs and is located on 2.5 acres of private woods and lush meadow. It is ideal for reunions, retreats, gathering of friends or relaxing get-aways. We believe it to truly be one of the most unique and desirable vacation rentals in the area. You'll be inspired by the scenic beauty which is unsurpassed by any other location. The property also has well-used game trails which criss cross the property and you may even see the creatures that call this place their home. Your complete seclusion ensures a safe and private "get-together" or "get-away". It is our commitment to provide you with memories to be cherished for a lifetime - you may never want to leave. Leavenworth approximately 1.4 miles, within walking or riding distance. For local use only. Long distance calls must be made using cell phone or calling card. Fully stocked with amenities for your arrival convenience. Milk, butter, eggs, pancake mix, syrup, coffee, teas, hot chocolate, popcorn, rice, pasta and a variety of cereals. Sugar, flour, spices, and cooking oils. Foil, baggies, paper products. Great selection of children's books and adult novels and magazines. The house was just beautiful. It was well appointed, close to town and the host was very accommodating. We will definitely be back! Wonderful guests! Hope to have them back someday. Our group of 9 (including 5 kids) had a wonderful stay at the Bear Mountain lodge. The lodge was clean, comfortable, and well stocked with kitchen supplies. The house is located very close to town and there is s grocery store just a few minutes away. Julia was very easy to work with and responded to all of my questions quickly. The only downside is wi-fi is a little spotty in the area (not necessarily an issue with the house as we had problems in town also). I would definitely consider returning to the Bear Mountain Lodge and recommend it to others looking for a great place to spend time together. Thank you! for such a great review! You were wonderful guests! Love it when the lodge is so gently used but thoroughly enjoyed! So glad you had a wonderful stay. Hope you will return again! 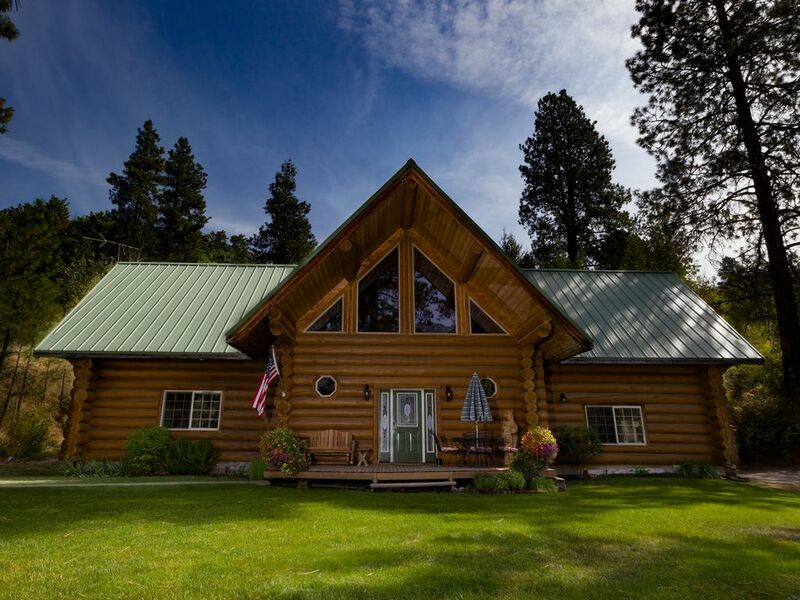 Beautiful cabin and perfect location to Leavenworth! We enjoyed a lovely weekend with family to do some shopping and view the lights in town! The hot tub was wonderful and the kids loved seeing the deer wander through the yard in the morning. Cabin was clean and well stocked with towels, condiments, paper plates, etc. Everything we needed! Highly recommend! Thank you! for your kind words! You were great, conscientious guests! So glad you enjoyed your stay and hope to have you back again. A girls weekend....wonderful and so comfortable. We saw mama and baby deer as well as a little black bear....which I understand isn't seen much so we were thrilled! Fabulous place!!! These girls were wonderful, thoughtful guests! So glad they thoroughly enjoyed their get-a-way! Hope to have them back again sometime. The deer are quite prevalent but the bear is rarely seen! Quite a treat to see one at the lodge. The house is absolutely beautiful with comfortable beds and great amenities, BUT be prepared to not have any privacy. The manager, Julia, came to the house while we were staying there completely unannounced. When no one answered the door she called me and proceeded to question me about the amount of cars that we had and the guests that were staying with us. We actually had less people staying with us then we had stated in the rental agreement. She had no right to come to the house while we were staying there, and we will be filing a formal complaint against her for the invasion of privacy. These people were actually great guests! I would rent to them again. I had no intentions of even going up to the house when I was bringing yard refuse to the burn pile down the hill and away from the house. When I arrived there was a travel trailer parked down the hill from the house. There had been no communication prior to their arrival about a trailer. Thinking about this from a managers point of view that raises red flags. There were four vehicles in the parking area but no response when I rang the door bell. Following instructions from the owner I called the person who handled the booking. I apologize if she felt I was interrogating her or invading her space and thanked her for helping me understand the situation. She was very polite as I felt I was. Again, they were great guests! This house is a gem; the wood structure is beautiful, the furniture and beds are exceptional, and the property has many excellent amenities. I would love to stay here again next time we come to Leavenworth. Really enjoyed having this group at the lodge! They were friendly, respectful, communicated well before and after their stay. Would love to have them back again. To avoid high credit card fees it is preferred that guests book using a national credit card not an international card. Thank you.